Again I was experimenting with the Liquitex Inks in my background with music and script stamping. I had cut some music notes and used the negatives to stencil and stuck on the notes shapes cut out. This is for The Craft Bart Alpha Challenge. Great colours and composition on this one too. Wonder if she is singing 'Dream a Little Dream' ?? Splendid quote for this ukulele piece. Delicious blues and greens too. I enjoyed seeing the jumping flea as the definition of ukulele, as well as those music notes. I was also impressed with this background, too. Lovely background for your page, great word to use. 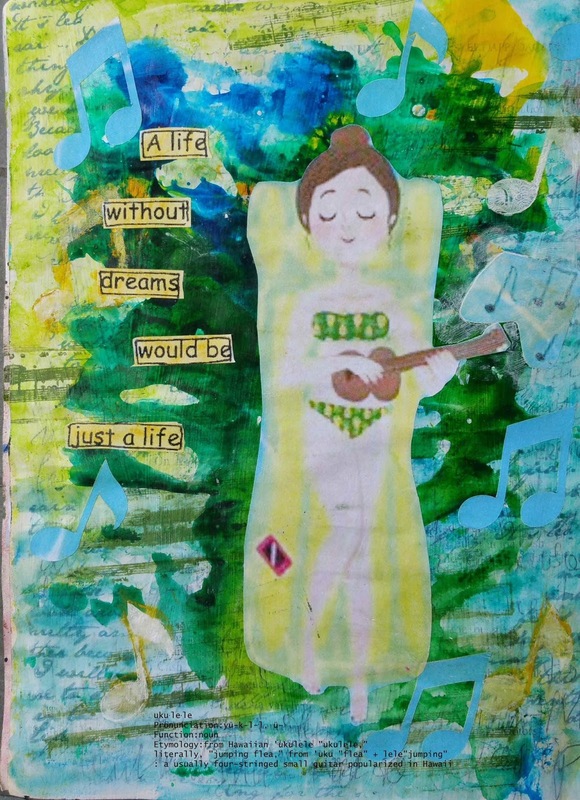 She looks so relaxed in her ukulele dream world. A great page.